Jen's Ink Spot: Have a Very Nice Day! Hi! I'm excited to share a card with you for this first day in June that I made for the last Lil' Inker Designs release. It was the very first card I made using these products but I've saved it to share until now. The Fringed Scalloped Rectangle Dies are perfect for creating scenes inside of! (They also make great frames for all of your shaker cards!) I created the grass in this scene with one of the dies from the Border Builders Die Set. 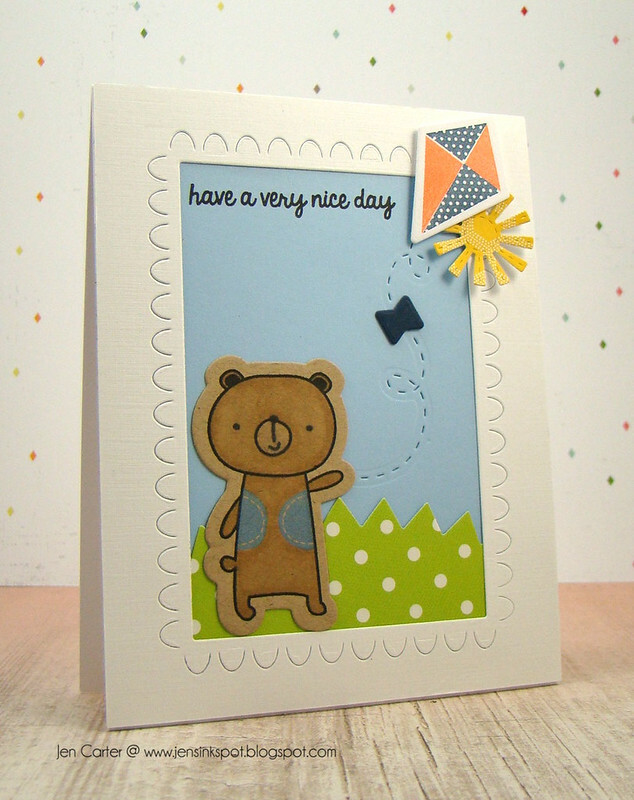 The cute little bear is die cut with the Kite Flying Dies (and as a note the dies cut much closer than shown here. I have the sample dies but the dies in the store do not have that much border around them.) & then stamped with the coordinating Kite Flying Stamp Set. I love that there are different options for the bear's vest! How cute is that!? The little swirl for the kite string & the kite is also die cut with the Kite Flying Dies and then stamped with the coordinating Kite Flying Stamp Set. The sun is the Sunshine Die Small. Thank you for joining me today! I hope you have a wonderful day!